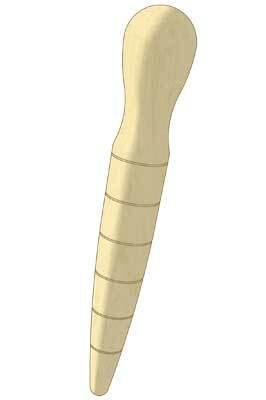 Every gardener needs a dibber for planting those seedlings, either in the potting shed, or out in the garden itself. This dibber is quite a simple turning project: take a nice close-grained hardwood blank about 250mm long and about 50mm square. 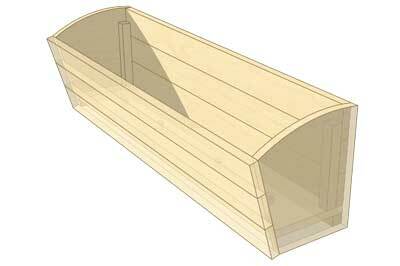 A nice hardwood like beech is ideal for this, but a softwood blank would do the job nicely as well. Mount your blank between centres and with the tool rest just below centre height, turn the blank to a cylinder with the spindle roughing gouge. You want your dibber to be a nice fit in your hand so a 40mm diameter will be about right. Next start shaping the dibber with the spindle roughing gouge. You should be able to create the handle shape where it meets the shaft of the dibber with this tool, and form the sloping shape of the dibber shaft, as well. Change to the spindle gouge to start forming the ends of the dibber. You might want to reduce the diameter of the blank above the handle with the beading/parting tool, to allow you to shape as much of the handle as possible. Once you are happy with the shape, and by now the dibber will only be attached to the waste by a small diameter spigot at each end, then it's time to cut the depth lines on the dibber. They are 25mm apart. Just push in the 'V' tool to a consistent depth for each mark... a few millimetres should do the job nicely. Now you've finished cutting, sand through the grits, to a finish you are happy with, and then you can apply a few coats of oil to finish. Then simply part off the dibber and clean up the ends with abrasive and apply a little bit of oil. Ever wondered how to create a cascade of plants without a fuss? 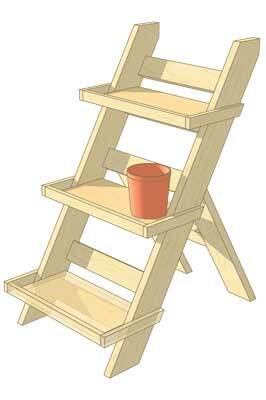 Our neat ladder pattern pot stand is the perfect answer. None of the dimensions are critical and can be whatever materials you can get hold of. The design is much like a ladder in that you have two strings at the sides, which are angled at roughly 55° from the ground, and battens across at the back. These are simply screwed in place through the strings. Then you have trays fitted between the sides which are probably best made from waterproof ply because of their width, which will keep water in them. A flat section is pinned around the outside edges to keep the pots in place. The batten behind each tray will stop the pots falling off the back. To hold the ladder assembly up, there are legs at the rear with a cross piece to hold them together, again made with a simple screw construction. Use a couple of hinges to hold it on to the ladder and, in the old fashioned ladder method, drill holes and fit knotted ropes through both ladder and legs to stop them sliding apart. Lastly, apply a suitable water resistant finish and your pot stand is ready for spring! If ever there was an exercise in using a chopsaw, then this is it. Really this is a batch production job, and as such it makes sense to set up your chopsaw so you can repeat cuts at will. You can adjust the size of the planter to suit whatever it is you want to put inside it. The best way is to set a stop on one side of your saw, clamped to a fence. With the blade set to 60°, the stop should let you cut lengths of the 75 x 25mm to just over the required length for each block. Then cut all your blocks out. You should be left with 30 blocks with one angle cut on one end. Then reverse the blade angle, so that it is 120°, to cut the other bevel. You then need to reset your stop on the chopsaw fence, so you can cut the second bevel on all the blocks, to cut all your blocks to their finished length. 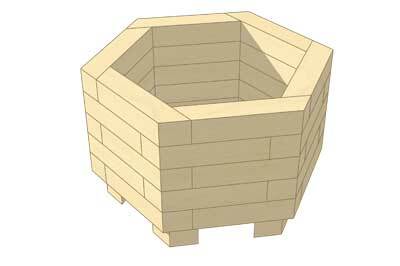 Now it's time to build your planter. All of your pieces should fit together nicely, and you can glue them all in place. You might find it easier to glue together one layer at a time, screwing through each block into its neighbour - but do this on the inside faces only, where the screw holes will be hidden by what you put in the planter. Then pile each layer up, screwing and gluing into the one below. Each successive layer will hide the previous layer's screw holes, until you reach the top layer, of course. This layer can be screwed through its inside face into the layer below, again hiding the screw holes. Or, you could just glue it in place, holding it steady with a heavy weight until the glue goes off. For the base, just route a rebate around the inside bottom edge, and pin or screw the ply in place, before screwing and gluing four feet in place. You will want to drill drainage holes in the ply base, too. Then treat the whole thing with a preservative finish, and it's ready for use! A window box or boxes enhance the look of a property, are easy to maintain and perfect for town or city dwelling, and even for that picture postcard look if you live in the country. The construction of this one couldn't be easier. You need a series of boards to make up the front and back, preferably TGV so they stay together. If not, use several vertical battens screwed on the inside, to do the same job. These boards are nailed or screwed to the ends which are vertical at the back but angled at the front. A fillet screwed in each corner reinforces the construction. The base is fitted inside all the other components and nailed and glued in place. You need to drill some drain holes and coat the entire thing in a water resistant finish. The last job is to put the window box in place and I would suggest if it is placed on an upper storey window ledge, that you fit loop eyes to it and the outer window frame with retaining wires or nylon ropes so it cannot accidentally fall off when loaded with soil and plants. All you need now is some rain and sun for a vibrant window enhancing display. Of course, this design can be modified to make boxes of all different shapes and sizes. And there we are: four great designs to help you with your gardening in the spring. Enjoy!